What is Colostrum Hydration Plus? The Lansonn Colostrum Hydration Plus is rich in active ingredients and essential care ingredients expertly combined in a highly absorbable luxurious cream. At the heart of the formula are moisture-restoring amino acids, in particular Colostrum, Many of the same factors that make Colostrum such a highly regarded nutritional ingredient also make it an ideal for use in cosmetic products in particular the key active ingredients being the Ig components, Lactoferrin and Lactoperoxidase. Colostrum with good reason is hailed as the wonder product of the millennium for its ability to act in an anti-aging capacity. Through available research it would appear that Colostrum acts to stimulate regeneration of cells (including skin cells) and also has an inhibitory effect on harmful bacteria, yeast's and viruses. Of particular importance is the presence of IgF1, although present in small quantities in Colostrum, IgF1 possesses unique "tissue repair characteristics" as reported in Vol 4 of the 1998 Journal of Longevity. The use of Colostrum as a functional ingredient in skin care products provides a bountiful source of naturally occurring compounds; these compounds are presented in such a manner that provides for optimal uptake through the skin. Medical studies have also found that Colostrum can be an effective topical application for burns, cuts and abrasions. 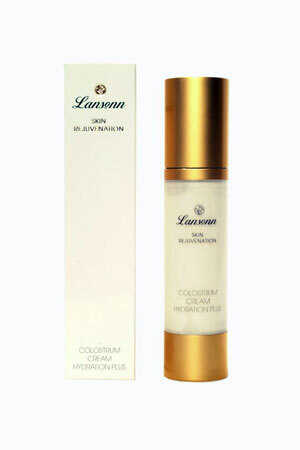 The Lansonn Colostrum Hydration Plus also includes a trio of other beneficial milk extracts including Lactoferrin, Lactoperoxidase and milk Glycerides each of these ingredients offer specific skin care benefits including cell growth promotion, general antimicrobial activity, general anti-bacterial and anti inflammatory properties. A host of natural emollients including Cranberry Seed oil, Rice Bran oil, Almond oil, Macadamia nut oil, Sunflower oil, and Cranberry oil In the Lansonn Colostrum Hydration Plus offer intense hydration action to combat dehydrated and damaged skin. An additional emollient included is an Olive complex, this ingredient in recent studies has been shown to protect against UVB damage and demonstrates good antioxidant properties. While several novel ingredients are included in the Lansonn Colostrum Hydration Plus of most interest is the inclusion of Kinerase (also known as N6-furfuryladenine or Kinetin) this is a plant hormone responsible for cell division. This ingredient has been the subject of major clinical trials out of the University of California, Irvine. Results from these trials indicated ability for Kinerase to reduce the signs of aging, improve sun damage and reduce surfaced capillaries.